Want to win some FREE stamps from ISC? 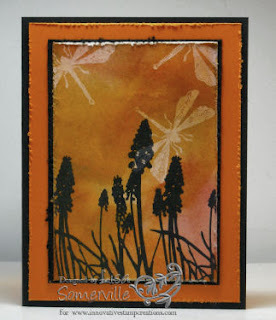 This weeks challenge is to create a project, using ISC images only and incorporate any Tim Holtz technique. What's so fun about this challenge is that I'm actually heading to CHA later today to take a class with Tim Holtz! I'm super excited - I'm taking the class with Allie the owner of Croppinsville. So, you want to know how to enter? Simply create your project using ISC images only don't forget to use one of Tim's Techniques - upload your project to your blog (or if posting to SCS please use keyword ISC8), then leave a comment on the ISC Blog with a link to your card. A random name will be chosen and announced on the ISC blog! The winner will receive a sheet of ISC images! Entries must be posted by July 27. To create my card I used the March Technique, but had to morph it a bit - as I had no distress reinkers...What's a girl to do??? I grabbed a spritz bottle and went to town! Following Tim's directions, I stamped my dragonfly from Art Frames II with the White Dabber on a manila tag and heat set. Then (here's where the morphing begins) added some perfect pearls to my water filled mister, and spritzed. While the tag was still nice and wet, I dabbed on Fired Brick, Marigold and some Brushed Corduroy Distress Inks, spritzed again, then dried with the heat gun. A bit more work then Tim's directions, but still a lovely look. Once dry, I stamped my flowers from Natures Silhouettes in Black Archival, let dry, then cut my tag to use on my base card. Lisa - I love this card - absolutely gorgeous and the colors are a WOW!!! Class with Tim....she says drooling.you lucky gal! How cool is that! You rock Lisa!!! luv the card too!